This product is suitable for thermosiphon systems with higher level supplying cold water tank, and for forced systems (direct or indirect pressurized or non-pressurized systems). It consists of evacuated glass tubes connected horizontally to a stainless steel collector from two side. The collector is insulated with high-quality polyurethane wrapped with galvanized coated steel or stainless steel. It’s possible to connect more than one collector serially to increase hot water capacity and it can be installed on flat or tilted roofs (0° - 90°). 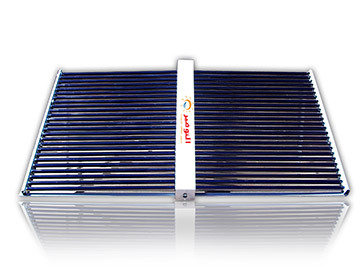 Widely used in solar thermal projects such as residential and commercial buildings (hotels and schools), swimming pool heating, underground heating systems, and industrial applications, it’s a cost-effective effective and reliable solar collector that has an easy plug-in installation and operation.